The ability to share completed templates is very important for your business. 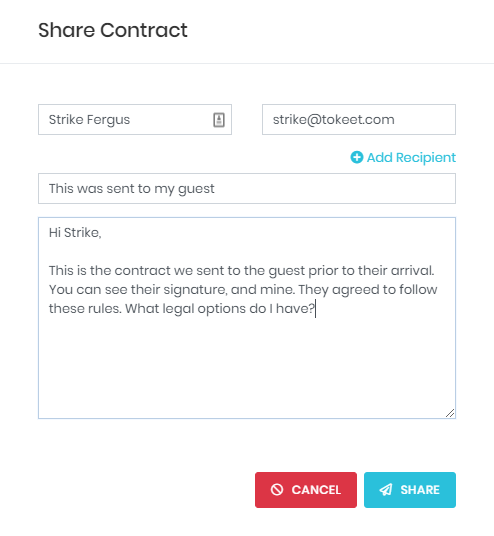 Whether you need to share a rental agreement with the authorities, or you need to share a menu request form with the chefs, Signature makes template sharing quick and easy. 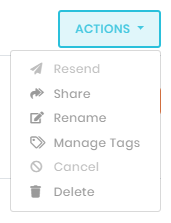 Click the Actions button and select Share to open the Share Template modal. Enter the Name and Email for each recipient. Enter a Title and Message body for the email that will be sent with the shared template. Click the Share button to send the template to the specified recipients.